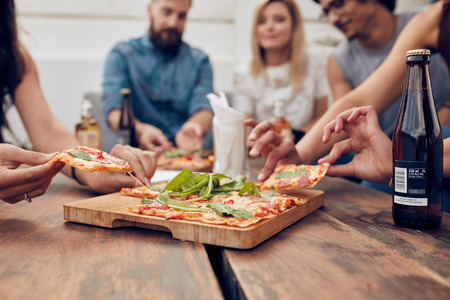 Close up shot of pizza on table, with group of young people sitting around and picking up a portion. Friends partying and eating pizza. Beschreibung: Close up shot of pizza on table, with group of young people sitting around and picking up a portion. Friends partying and eating pizza.